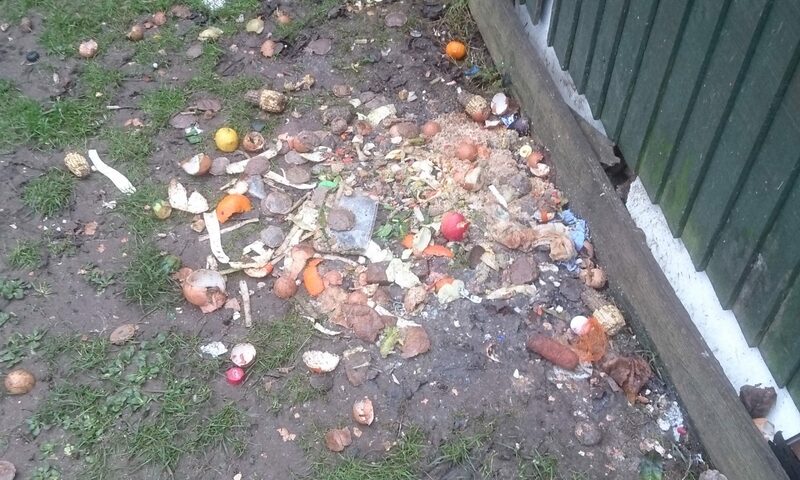 Feeding pigeons is bad enough but dumping food waste…! I’m the first to admit I find fly-tipping and feeding pigeons extremely irritating. Both are anti-social and give no thought to the problems they cause. However, when I saw that someone had emptied the contents of their food waste bin on the patch of grass by Sainsbury’s …….well, that’s just too much. I’ve cleaned it up this morning but how could someone think this was a good idea? The pigeons aren’t likely to eat eggshells, teabags, banana skins and orange peel. It will just attract rats. The Council knows this patch of grass is a problem and will, I hope, one day soon redesign the area to put in some communal flower beds and signs asking people not to feed the pigeons. WEN has offered to help and I’m sure we can get volunteers to help when the time comes. In the meantime though I just hope no one else thinks it’s good for wildlife to empty out the contents of their food waste bin and let it rot away and attract rats. And today (Friday) there was a pile of bread in exactly the same place. However, when I went back a bit later to clear it up it had already gone. So many thanks to whoever was kind enough to do that. The rubbish collectors have been clamping down on people who have put food in their standard rubbish bins. Hope this isn’t the start of a pattern. Well done for picking up. I previously wrote sometime ago on this blog that there is a far bigger problem with the feeding of pigeons in Dean Gardens. I also sent two (2) emails direct to Ealing Parks regards the feeding of the pigeons and never even got a reply. Last week I attempted to remove a metal foil baking tray put in “hole” in the ground (near Uxbridge Rd side) used to fill with water to feed the Pigeons ,the person who put the baking tray their , confronted me and became aggressive and took the tray of me before I was able put in the waste bin. I have now filed a complaint (this is the second time) with the Ealing Police regards this , and not bothered to complain to Ealing Parks about this incident . About 3 months ago, while in the Dean Gardens I spoke to an Ealing Council employee who job is to remove dead rats from the Dean Park about the feeding the Pigeons on an ” Industrial scale” with bread, and he agreed the reason why there a problem with rats is because they feed off the leftover bread, he also,, advised the water in the baking tray also attracts the rats, he also advise that it unsafe to handle the baking tray as rats carry many diseases that are harmful to people. Can someone explain to me and anyone read this blog why Ealing Council is either unwilling or unable to deal with this problem. This problem has been going on for years, if there any Councillors from West Ealing reading this feel free to voice your view on this. 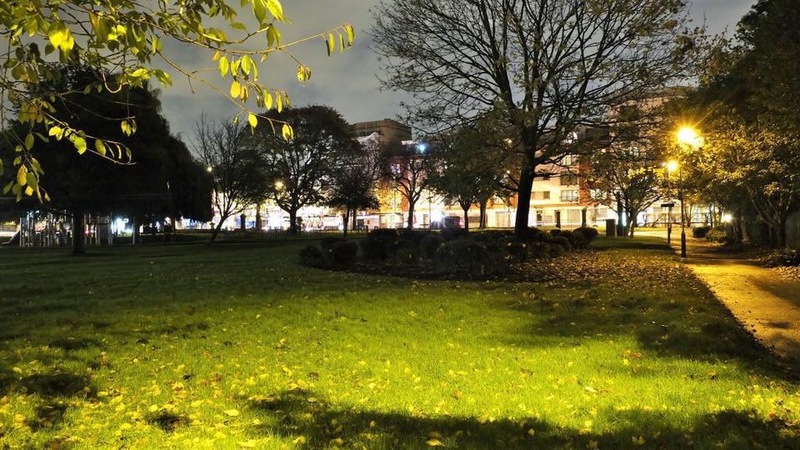 I share Michael’s frustration with the problem of food fly tipping in Dean Gardens. Often when I pass by on the bus I see people dumping bags of bread products onto the ground intended for the pigeons to eat. Despite there being CCTV in the park, nothing ever seems to be done to stop the culprits. Why can’t the authorities enforce the rules to stop the unhealthy practice of dumping food for the pigeons. Not only does it attract rats, it is unhealthy food for the birds and helps to increase their numbers, which has a knock-on effect of causing damage to nearby buildings. If I did not need to get to work each day I would get into the park and share my thoughts with the polluters. Many years ago now a sign warning against pigeon feeding was painted black – probably by the same person who painted over the sign in Melbourne Avenue. Previous PostPrevious Is it a warm welcome for the black and orange mobikes?